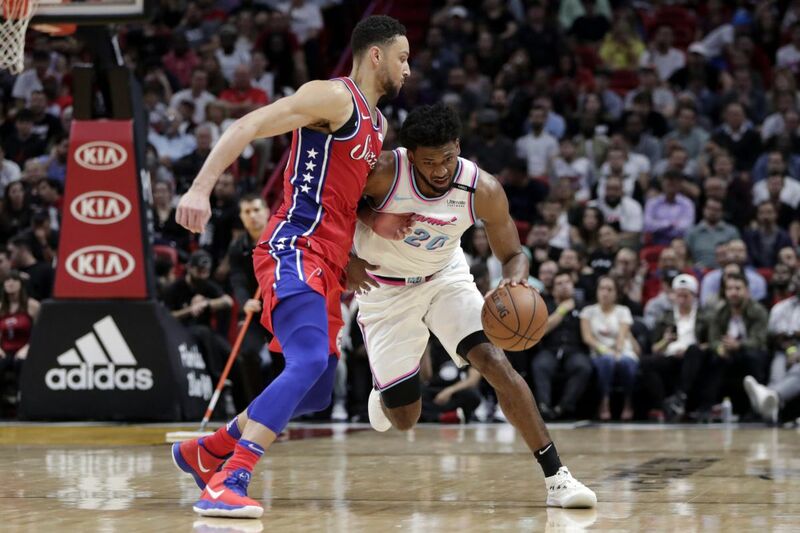 The Sixers’ Ben Simmons defends the Heat’s Justise Winslow (20) during the second half. MIAMI — Ben Simmons has an idea why the 76ers lost to the Miami Heat on Thursday night. "I think, for us, we just didn't come ready," the point guard said of the 108-99 setback at American Airlines Arena. "First quarter, we looked like we were ready to come out and play. And then we showed a lack of composure and didn't stay with it." Asked what caused the lack of composure, Simmons said, "I don't know." The Heat, in contrast, played with physicality in a game that had a playoff feel to it. The Sixers (35-29) made 10 of 19 shots, 52.6 percent, en route to trailing, 29-28, after one quarter. Things unraveled in the second quarter as they missed 16 of their 24 shots. Taking advantage, the Heat (35-31) built a 49-37 cushion with 3 minutes, 48 seconds left before intermission. The Sixers battled back and regained the lead, 57-56, on JJ Redick's three-pointer with 10:44 left in the third quarter. But after several lead changes, Miami took the lead for good 28 seconds into fourth quarter on a three-pointer by former Episcopal Academy standout Wayne Ellington. The Sixers, for the game, shot 39.5 percent from the field and committed 18 turnovers, which the Heat converted into 20 points. "You always go to the tenacity of Miami's defense," coach Brett Brown said of his squad's shortcomings. "They are here at home. They are trying to tie up the [season] series [with the Sixers]. They had a tough loss to Washington [on Tuesday]. … And they are a really good defensive team." The two teams split the four-game season series. Small forward Robert Covington had the Sixers' worst shooting performance. He missed all 10 of his field-goal attempts — including five three-pointers — in scoring three points. Covington was benched in favor of reserve Marco Belinelli for the final 4:48. "Keep shooting," Brown said of his message to Covington. "And you say it like three times. The last one, you say it really loudly. "As long as he's guarding, that's where my interest really lies." The Sixers flew back to Philadelphia after Thursday's game. They had off Friday and will travel to New York after Saturday's practice. They will face the Brooklyn Nets at 7:30 p.m. Sunday at the Barclays Center, having lost eight of their last 11 road games.